I love Lavender. It's not something I initially appreciated but in time I have come to love the soothing and relaxing smell - especially in a crazy stressed out world. 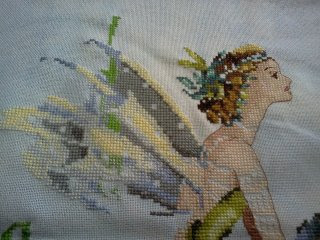 I recently needed a break from my Bliss Fairy and decided to work on a pixie - my first - not my last! So, with that said, I proudly present: Lavender by Nora Corbett. This little lady stitched up in 1 week from start to finish. 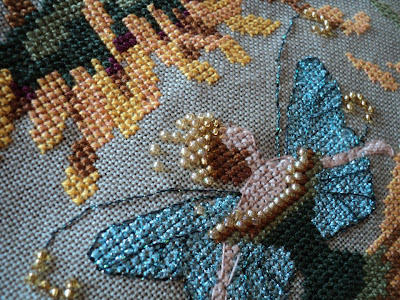 I loved every stitch of it. She was stitched on a piece of 28 count Impressionism by Sugar Maple Fabrics. 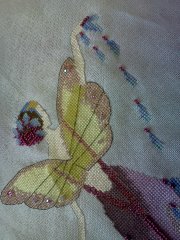 My favorite part of this pattern is the way Nora designed the wings to look opaque even though they are stitched solid. Amazing a little colour trick can do! As for Bliss, I do have more done - but we weren't talking for a few days. We made up last night. I am working on the giant flower. Pictures to come soon! I like to pride myself on being a disciplined diva - what does that mean? It means I like to have one project at a time and finish it before I start another. 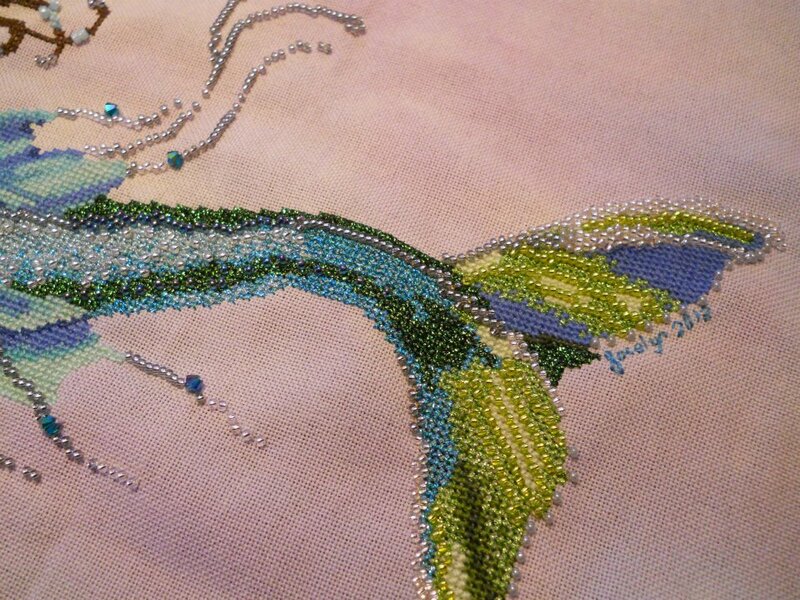 I find as my stitching evolves I have moved away from that a bit. I seem to prefer having one main project and some side tracks. I have been working away at Bliss and honestly - the wings got a tad tedious - the colours aren't very vibrant - don't get me wrong -they are beautiful and soft - but the colours weren't inspiring me to stitch. Regardless - I'm so close to finishing those wings - here is where I left her. Thursday night I decided to play with my fabric and patterns.... we do that sometimes, don't we? 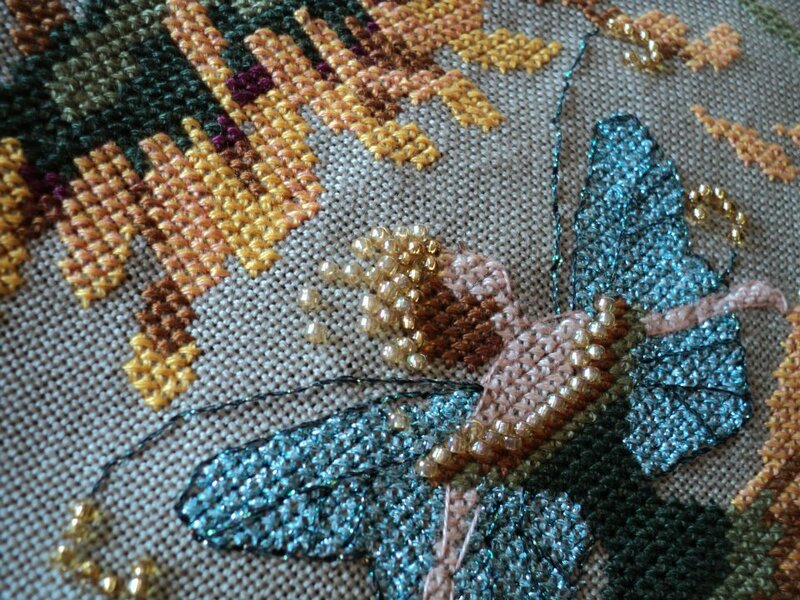 I have been drawn to the idea of stitching some of Nora's Pixies. 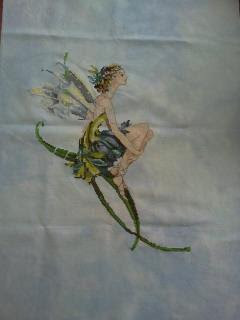 I really love Lavender pixie and I had this piece of fabric screaming 'Pick me! Pick me!' - so I started her. 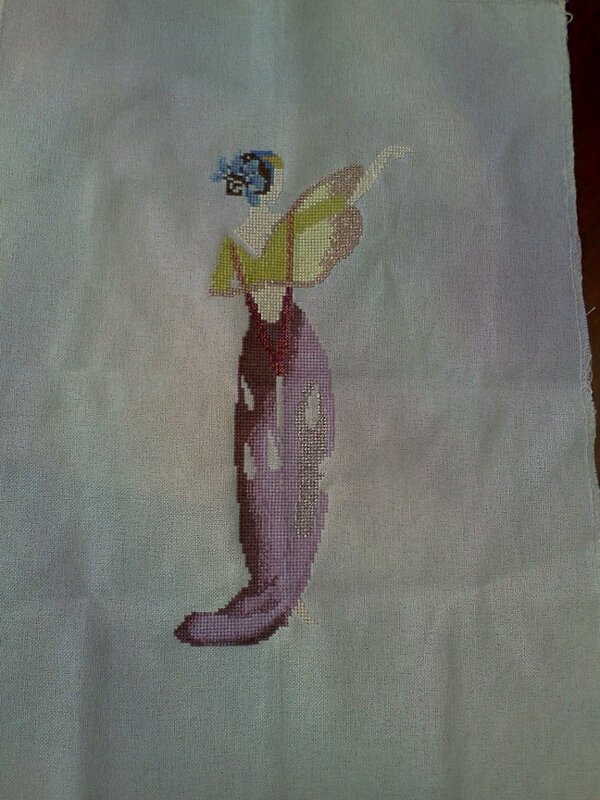 I decided to dedicate the weekend to stitching my heart out on Lavender. 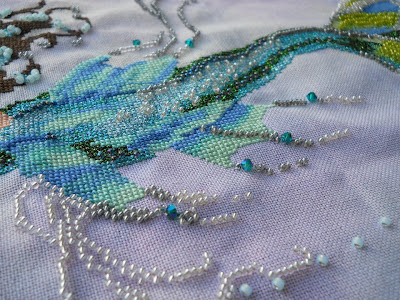 It was just flowing - flying off the page and onto my fabric - I now decided that I will see her through to a finish but suspect I will be done before this weekend - I know sounds fast but hubby worked two night shifts this week and I stitching like a mad woman when he is away for the night. 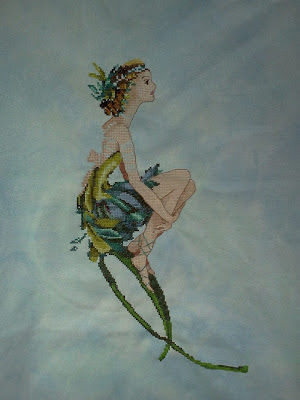 She is stitched on Sugar Maple Fabric's Impressionism (out of business sorry girls) - it is a beautiful fabric. I will say I have a piece of Crafty Kitten's Evening Sky and I find they are quite similar if you are looking for this effect. I have decided this is for my daughter Chelsea. Chelsea is five and she loves purple. After I am done this I am going to do one for my eight year old, Kailee as well. I haven't stitched anything for my daughters before - although I guess in many ways they are all for my daughters. Another fun thing! I got accepted into another Round Robin! Its with the Yuku group: The Worldwide Round Robins. This one is slated to start January 2013 - it is a "big box" Mirabilia Round Robin. The boxes are for 5000 stitches opposed to the one I am doing now, which is 2500. This will allow us to do some bigger designs. Look - I know its more than 6 months away - but I have started planning my Round Robin - how can I not? I have decided to do the them "Roses" and I have chosen the patterns: Ashley's Roses, Rose of Sharon, Rose Arbour and Lady of the Mist. Here is a mock up of what I envision so far.... total work in progress here.....the border in the middle is taken from Mirabilia's Garden Muses, just repeated. I hope to finish Lavender this weekend and get back into stitching Bliss. I know once I get past those wings we will love each other again! Recently I had my magazine out with my Sunflower Fairy in it. I had stitched this beautiful little girl for my mother in law for Christmas. She is a fast and easy stitch - but it calls for Valdani's and knowing how little she was I didn't want to invest in the Valdani's. I decided to do a DMC conversion - which I think turned out pretty good. So with that said, I wanted to post my conversion so it doesn't get "lost" in my computer some where. 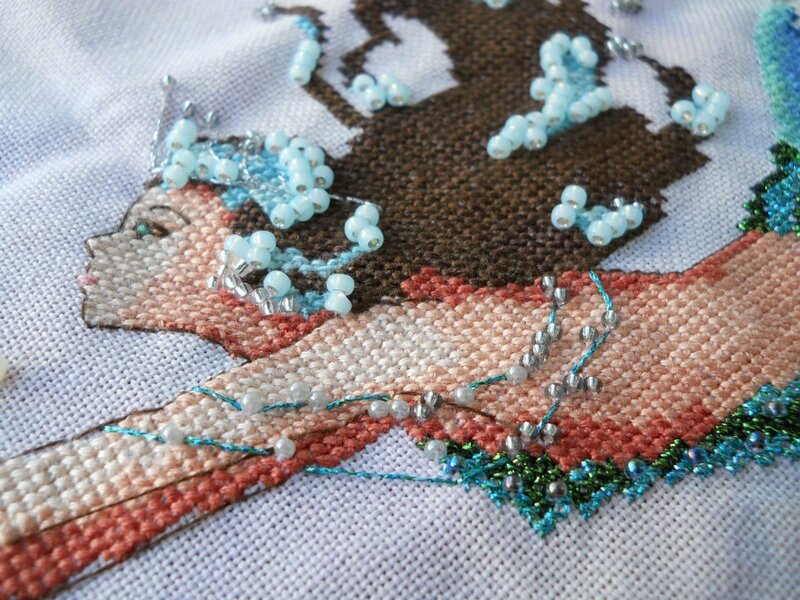 I didn't like her skin backstitched in brown so I used 3371 however, any peachy colour darker than 945 would do. Please note: now that I'm done I wished I had stiched the skin 1 over 1 - just a suggestion! 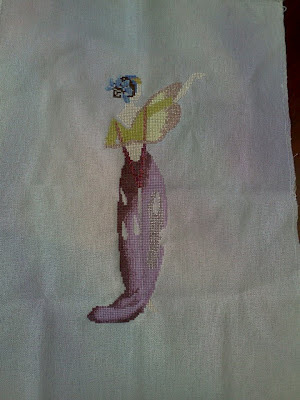 It took me just over a week to stitch her - she is small and fun. It was the first Mirabilia I ever gave away. Here is the finished product all framed up! Don't you love how cross stitching can just take it all away? I have been absolutely indulging in my Bliss Fairy. Today I put a few stitches in her at lunch time - in my car - I just needed to close off the world for awhile. There is an article on Facebook circulating how stitching is equated with stress relief - hmmm... stitchers already know this. I am looking forward to this week coming to an end. I have another open house on Saturday and I'm going to take my daughters to see Puss in Boots at the Community Centre. My husband is working Saturday night so I have planned to "meet up" online with some of my stitchy friends for a Google+ hangout. 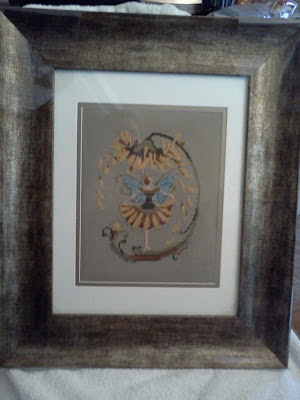 Yes, stitching is great - but having stitching friends is better! 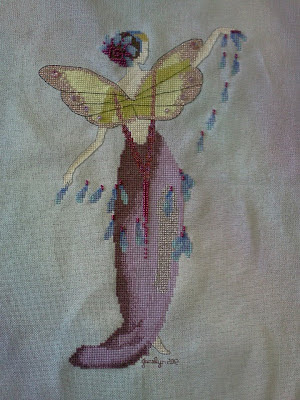 Mirabilia's Bliss Fairy stitched on Crafty Kitten 28 ct Summer Sky evenweave. Last week - exactly a week ago - I got my third round robin piece. I am participating in an 8 project Round Robin and the theme is Mirabilia. This round I got Debbie's and her piece was open to the stitchers. 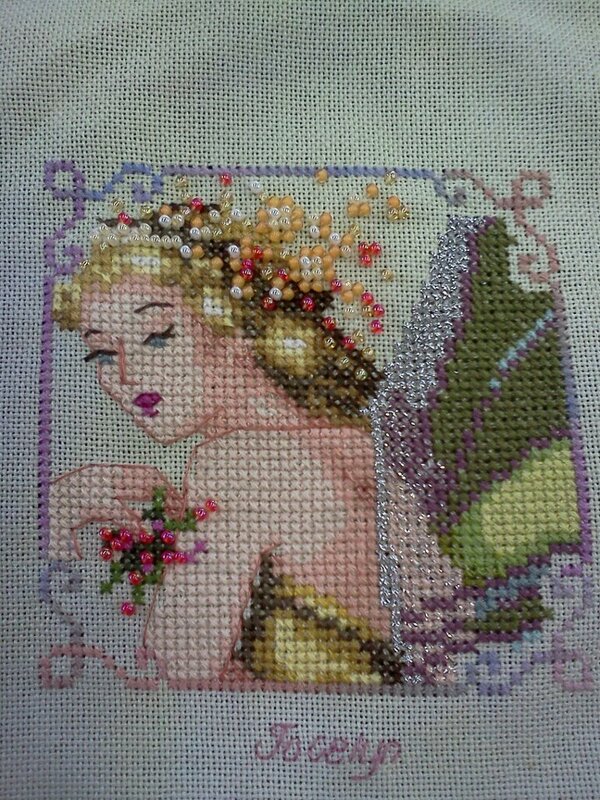 As a stitcher I loved having an open theme - she asked for anything fantasy - pretty much any Mira would do! I personally have too many control issues to allow others to choose the designs on my Round Robin. Its not that I don't think they would choose a great pattern - I'm just particular about how I want the overall piece to look. So here is the block I chose to stitch for Debbie. 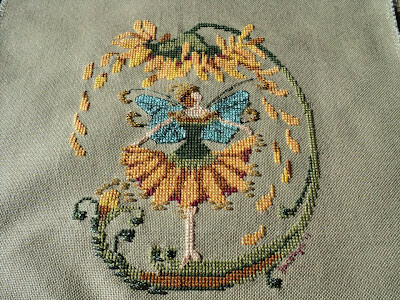 I stitched the Woodland Fairy - I did not make any pattern changes exept the sandy colour beads are a substitute - but very close to the suggested beads. Oh - did I mention how much I hate blending filament? I really had a hard time getting that going - wow - I feel like I'm a good stitcher but that had me SO frustrated! I had a lot of suggestions to use thread heaven - I will pick that up if I am ever to do a full scale design with BF again! ﻿Debbie's piece now has three complete blocks - Debbie did the Shimmering Mermaid, Julie did Silver Moon Tea (another on my to do list!). 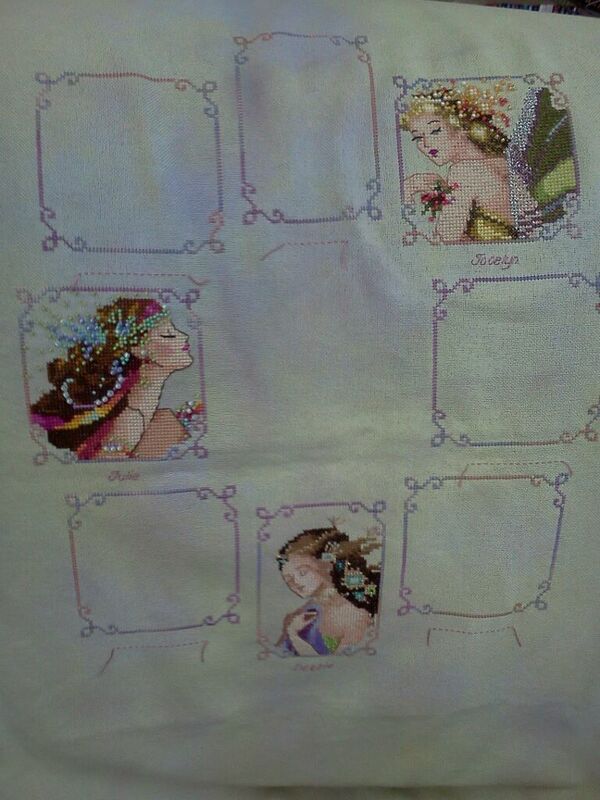 Today I am picking up 11 new Mira patterns that I am buying from a lady that went out of business. As they are new I have offered them to some Mira friends at my cost + shipping - OH YEAH - I'm keeping some to myself as well! I am excited to have them all in hand. I will take a picture because I know you like to look! LOL! Now that my RR and Cleo are done I can concentrate on my Bliss Fairy again! I have missed her. New updated photos soon! 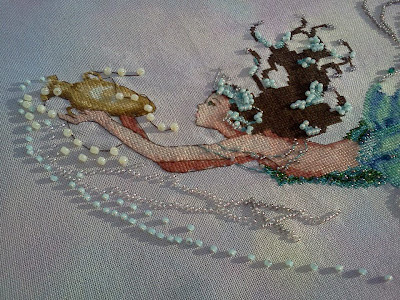 Well I finally finished off the Mediterranean Mermaid - or Cleo as I call her. Is it just me or is Mediterranean one of the hardest words to spell? (I am a bad speller). The good news is that Miss. Cleo (the Mermaid - not the psycic) is for my unborn neice - yep its a girl! I'm very excited to have my first ever neice. 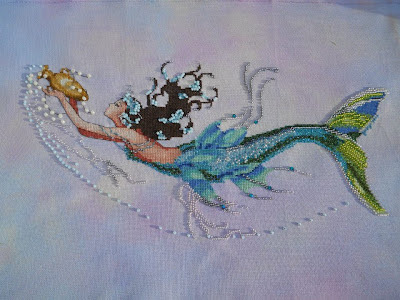 So without further waiting - here is miss Cleo - aka Mediterranean Mermaid by Mirabilia stitched on Crafty Kitten 32 ct jazlyn on Daybreak. I made some changes here: her eye for one is opened - I mistakenly took ./. for .\. and she ended up with beads in her hair. I skipped the tear drops on her necklace because they were $2 each x 3 - and I had enough invested in her. Beautiful tail! I also changed the clear bicones to blue ones - the blue ones were cheaper and I liked the colour of them. The colour differences in the photos are simply outdoor light to indoor light. Honestly, I am glad to be putting this little girl to bed. I am going to frame it for my sister. The baby is due late August, but my sister's birthday is May 21st. So I'm aiming for then. I am still working on Bliss. I don't have her with me or I would do an updated photo - coming soon. I also just got the 3rd RR. 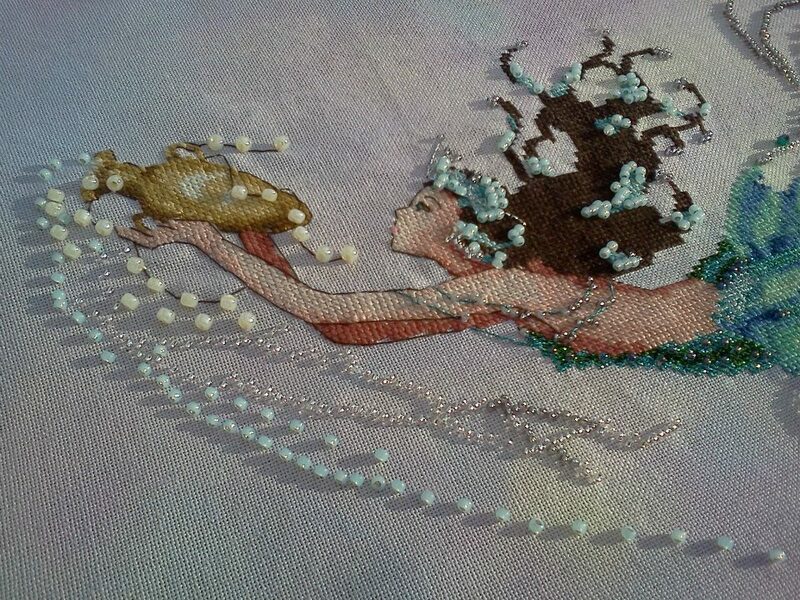 It has an open theme with a wish for fairies and mermaids - I chose Woodland Fairy and I have her all kitted up so she should be making an appearance soon too.